Daikon Radish: These noodles are great because they are firm and can hold up to any sauce. However, they have a very bitter and soapy taste, so the right sauce needs to be used to flavor the daikon. Sweet Potatoes: They absorb liquid very easily, so they go best with a light, creamy sauce. 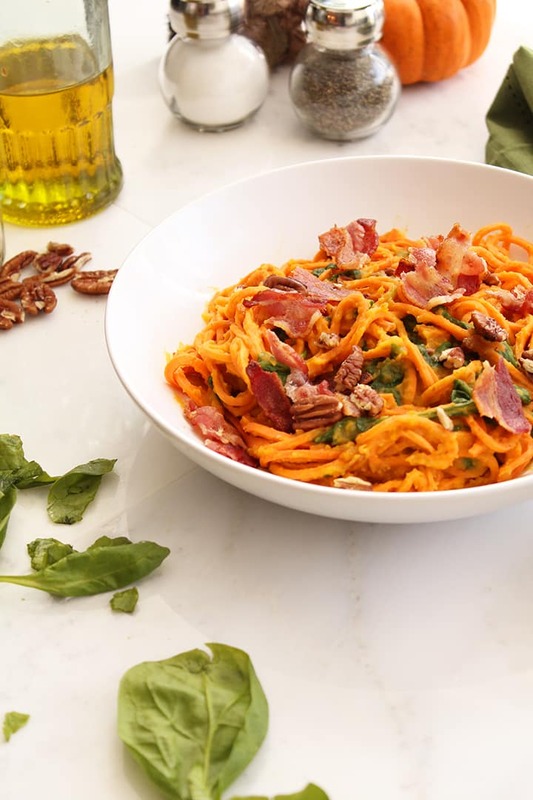 Butternut Squash: This vegetable spiralizes very cleanly and offers noodles that definitely stand up to sauces. They are also moist, so a little olive oil, salt and pepper goes a long way here and lets the natural taste of the veggie come forward. Carrots: Like sweet potatoes, they asborb liquid quickly, so a cheesy or creamy sauce is best. Parsnips: These are a bit tougher to spiralize (they are hard to find in a size large enough), but are a savory root vegetable that goes nicely with a little olive oil, salt, pepper and freshly chopped herbs. Beets: These have a great consistency when spiralized and cooked – they taste best when paired with cheese or an oil-based sauce. Back to the recipe. 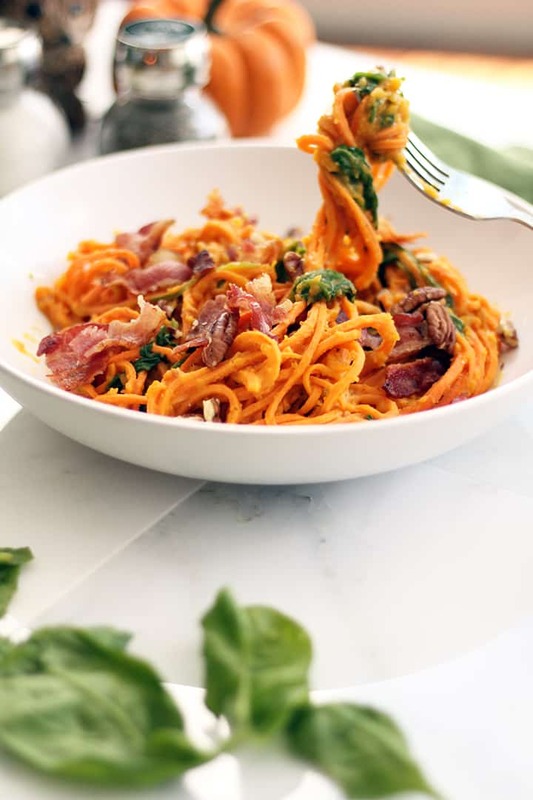 While sweet potato noodles are heavier in calories and carbs than zucchini noodles (obviously), they’re just the ticket when you need a warm and filling meal that doesn’t pack a big calorie and fat punch. It’s a cleaner way to eat pasta no matter how you break it down. Plus, sweet potatoes are high in iron, fiber, Vitamin D, C, B6 and they are a rich source of magnesium, which is an anti-stress mineral. Couldn’t we all use some destressing? 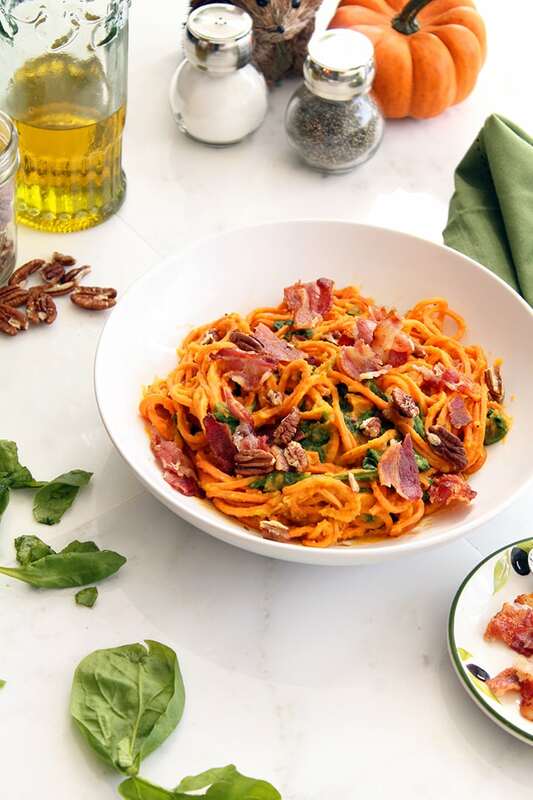 If that wasn’t enough to get you hooked, this butternut squash sauce is dairy-free and vegan, using almond milk to get the creamy consistency. The nuttiness of the almond milk brings out the flavors in the crushed pecans. 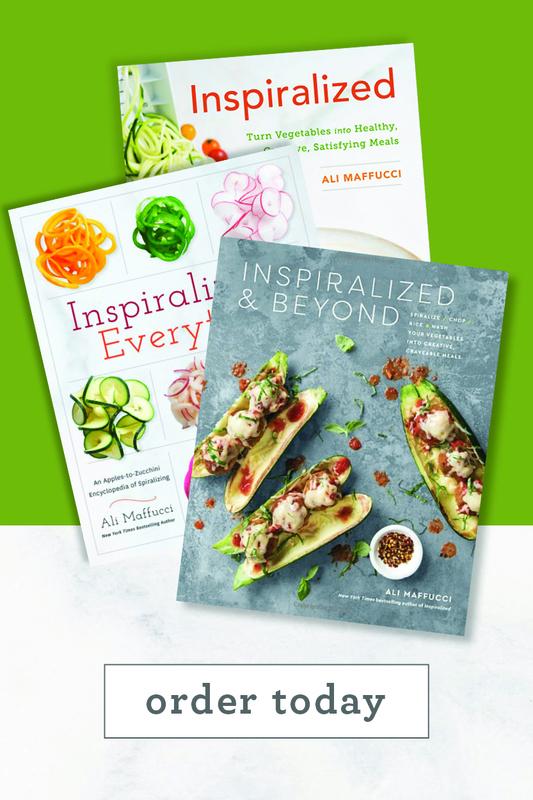 As for all of the other types of spiralizable vegetables… recipes coming soon, I promise. Also… is it awkward that I haven’t mentioned the cute little critter in today’s pictures? Bob and Diane have a pet! Preheat the oven to 405 degrees. Once preheated, add the cubed butternut squash into a baking tray and drizzle with olive oil. Season with salt and pepper. Dust lightly and evenly with the cinnamon. Mix together to combine and roast for 35 minutes. While the butternut squash is roasting, put a large skillet over medium heat. Add in the tbsp of olive oil and the sweet potato noodles. Season with garlic powder. 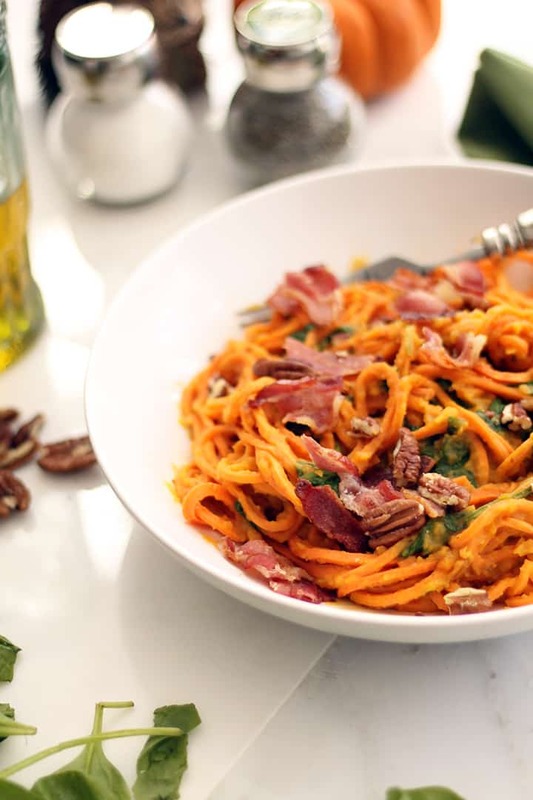 Cook for about 6-8 minutes or until sweet potato noodles cook through and are soft. Set aside. Place a large skillet over medium heat and add in the bacon strips. Cook the bacon until crispy and set aside on a paper-towel-lined plate. Once the squash is done roasting, add the cubes directly into a food processor. Add in the almond milk and half of the vegetable broth. Pulse until creamy. Place a large skillet over medium heat and add in the squash puree and the rest of the vegetable broth. Cook until the broth reduces and the puree is creamier. Add water or more vegetable broth, if not creamy. 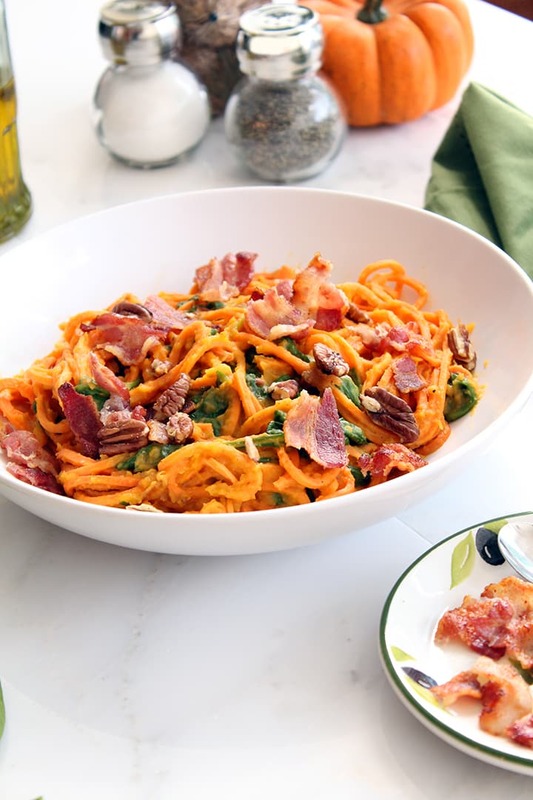 Once the sauce is done, add in the spinach and sweet potato noodles and mix to combine thoroughly. Let cook until spinach wilts. Plate the sauced noodles into a bowl and crumble in the bacon. Top with crushed pecans and enjoy! Mary - thank you so much for the kind note! Ali, this looks AMAZING! Any thoughts on how to tweak it for nut allergies? Katie - of course, just leave the pecans out - it's just as delicious! If you want something more hearty, use raw kale instead of spinach! 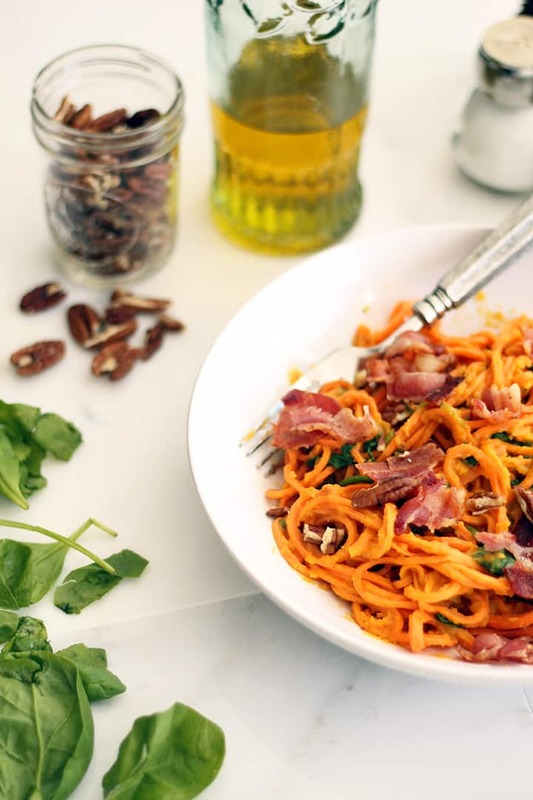 Orange veggies are truly my favorites so I am so excited to see all the spiralizing you do with them! 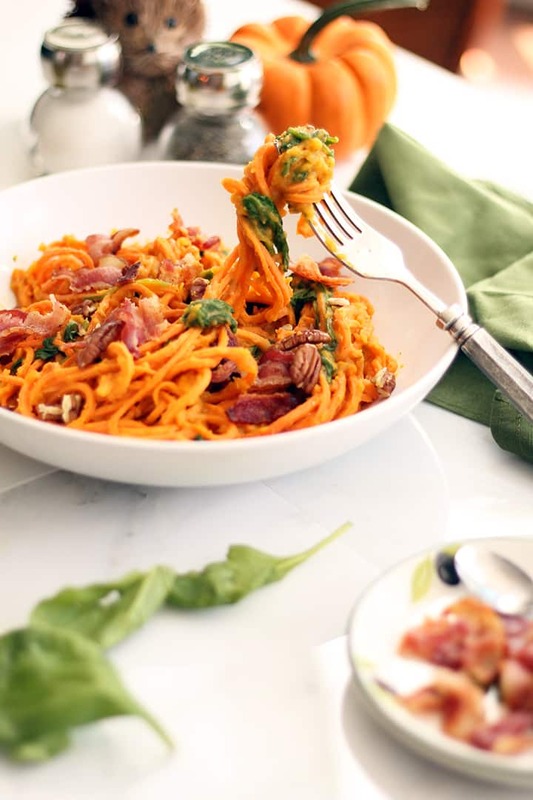 This butternut squash and sweet potato dish is the perfect way to kick off the orange veggie season! Thanks so much Joanne - it definitely is a super fall dish! 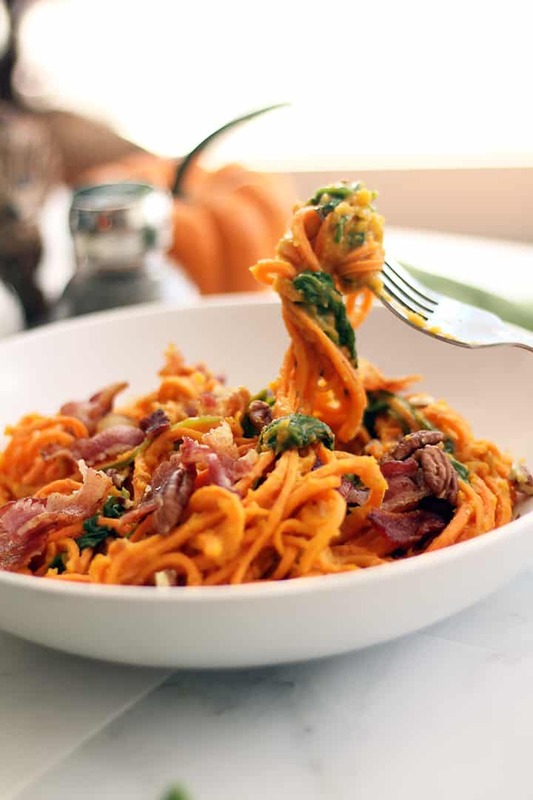 Just a different way to enjoy one of fall's favorite veggies! so creative! it sounds delish! Ali, I really enjoyed this recipe - thanks! It was great as written, but as a fan of bold flavors, I had to kick it up a bit. I added a half teaspon of cayenne pepper and a tablespoon of curry powder to the squash puree and it was absolutely amazing. That sounds great! I'll have to try that.. I'm so glad you gave this recipe a shot! I find it very difficult to put the sweet potato through the spiral slicer. What is your secret? Nuke for a few minutes? That video doesn't load. 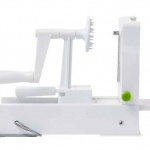 I'm sooo confused how to spiral things... can you explain a little more and what spiralizer do you recommend? Thanks! 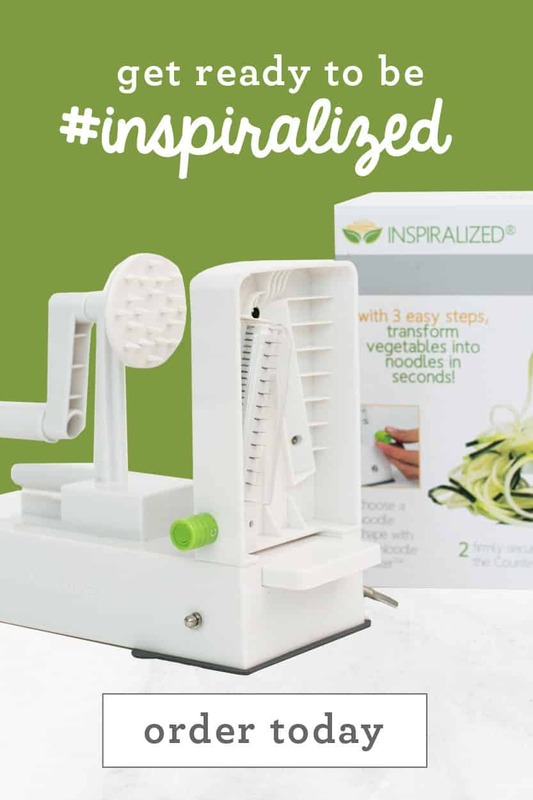 If you go to Inspiralized.com/shop I have the link to the spiralizer that I use! 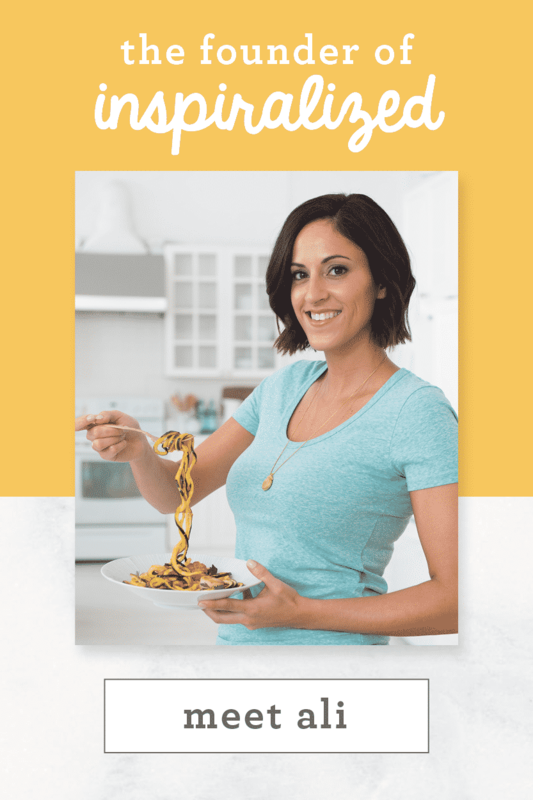 Go to "How to Spiralize" for a full tutorial. 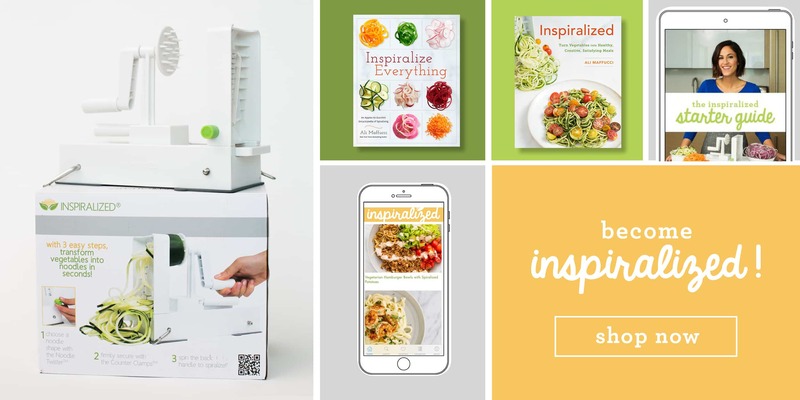 There are many resources on the blog for spiralizing! 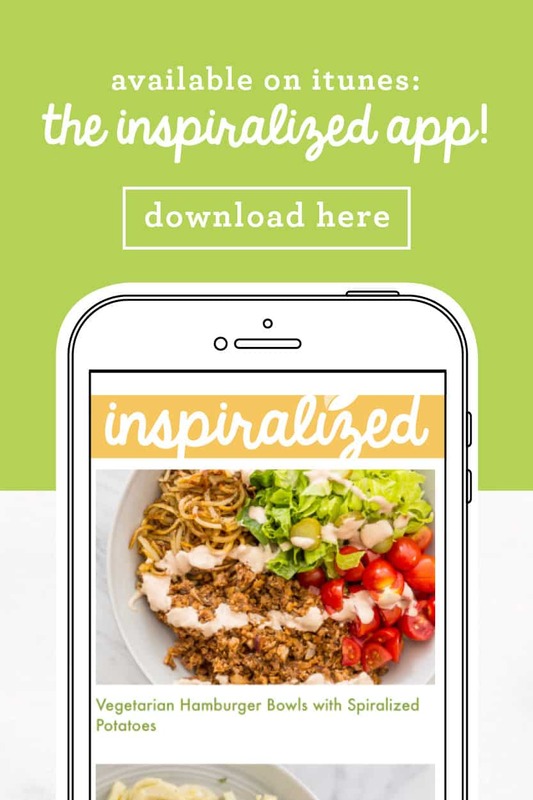 Go to Vimeo.com/Inspiralized or YouTube.com/GetInspiralized for videos! Ali, I noticed you didn't mention to first peel the butternut squash before roasting it. Is this a do or a don't? Thanks!! Yes, it must be peeled! Thanks for asking. Hi! 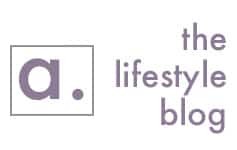 This is my first time *ever* commenting on a recipe on a recipe blog, but it's time :) Love your blog and your recipes, and have made several so far. (I even bought the Blurb book!) 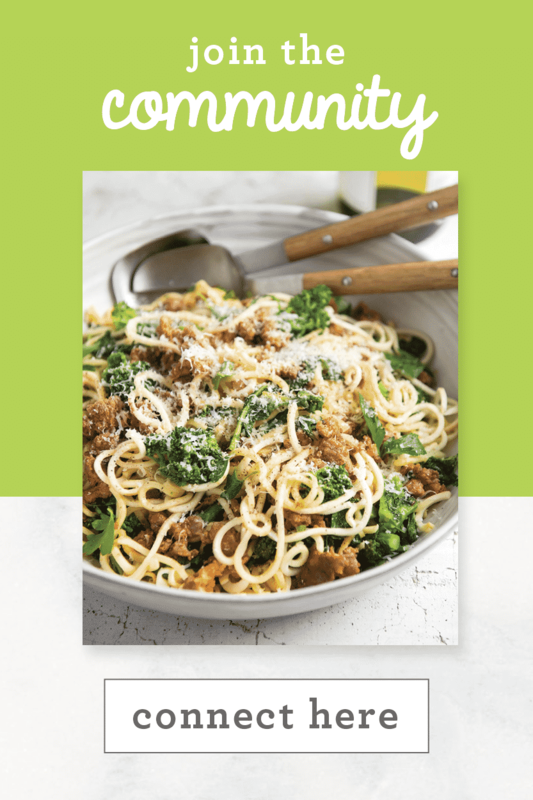 I made this recipe tonight - it turned out yummy! I have a couple of questions. Where should the garlic powder come in? And, when I tried to cook the sweet potato noodles in a skillet, even on low heat, they wanted to fry up like hash browns. (I also had to do them in about 4 batches, even with a large skillet, so it took a while!). Still loved it, just want to make it a bit easier for myself! Thanks! Thank you so much for commenting! 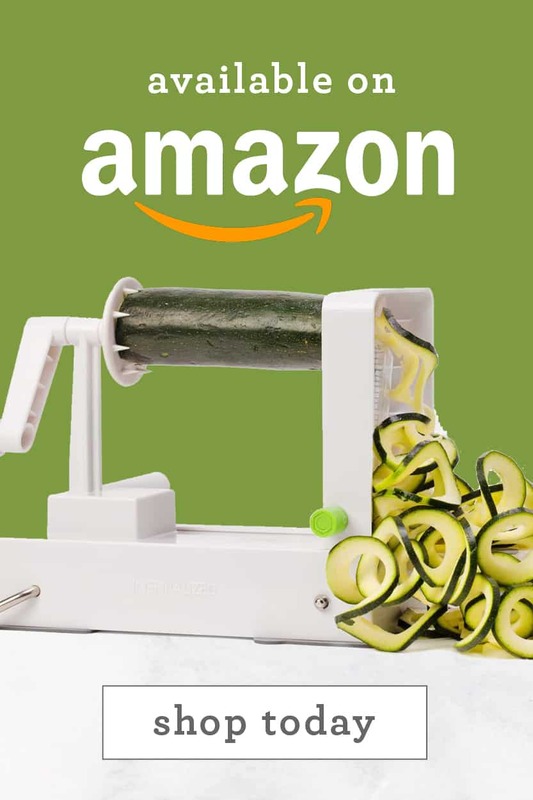 I'm so glad you're liking spiralizing. I've adjusted the recipe to reflect the garlic powder! Make sure you're always using a nonstick skillet, to avoid the hash brown issue! where do I find the calories, fat, carbs, and protien in these recipes? Is the roasting temperature 405? Is it possible you meant 400 or 450? Thanks! 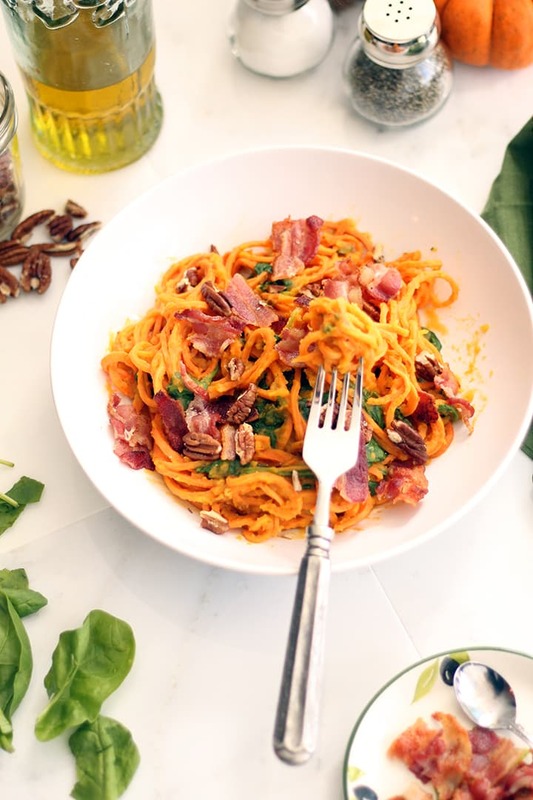 Oh my goodness, I just found another reason to love my new spiralizer!